This month we look forward to welcoming Northumbria University’s Sarah Winter, who will be giving the intriguingly titled paper: ‘Melodramatic Monster Villains in Early-Nineteenth-Century Theatre’ (abstract below). This will be followed by discussion, and drinks and refreshments at the pub afterwards. All are welcome and we hope to see many of you there for what promises to be a lively and engaging talk! ‘It lives! I saw the dull yellow eye of the creature open, it breathed hard, and a convulsive motion agitated its limbs’. Georgina Green is currently a Research Fellow at the University of York; prior to taking up this appointment, she completed her PhD at the University of Oxford and conducted research at Carleton University and the University of Warwick. 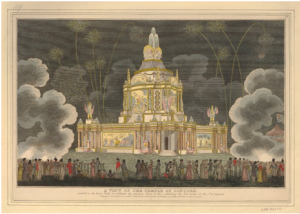 Her work centres on political and literary interactions in the 1790s and particularly on the relationships between individuals, groups, networks and the populace at large. 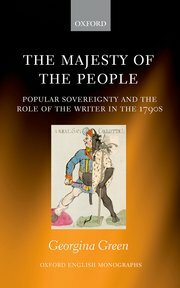 These concerns inform her first monograph, The Majesty of the People: Popular Sovereignty and the Role of the Writer in the 1790s, which was published in February by Oxford University Press and which we discuss below. 1. How did you first become interested in the idea of the majesty of the people? The end of the semester, that is. Happy writing and grading everyone! On the bicentenary of the first defeat of Napoleon in 1814 and the arrival of ‘peace’ in Britain and Europe, Nicola Watson (Open University) and Ian Haywood (Roehampton University) are delighted to announce a BARS-supported two-day conference devoted to an exploration of the cultural impact and significance of this momentous year. The programme in text is below, but for full details and to book, please visit the appropriate page on the IES website. The Wordsworth Trust have recently started a new blog on Wordsworth and Romanticism; posts already published include Seamus Perry on Coleridge and spring, Pamela Woof on Dorothy Wordsworth and Stephen Gill on Wordsworth himself. There are some superb Romanticism blogs available on the web, and I thoroughly enjoy reading the latest news from a range of academics who are passionate about sharing their research. It’s great to read posts on authors and topics outside of my own areas of specialism, and to keep up to date with what’s going on in the Romantic studies community. The problem with a lot of academic blogs is that they’re often written by a single researcher. This frequently results – and I know I’m guilty of this! – in blogs remaining stagnant for weeks or months at a time while various teaching and research commitments are met; it can also mean that that posts are rather narrow in focus. Being British, one of my favourite pastimes is talking about the weather (usually in a tone of complaint whilst drinking a cup of tea, of course), and I’ve always considered myself to be rather good at it — that is, until I moved to western New York. The Rochester snow makes a bit of British rain seem like a pleasant shower, a February blizzard makes London fog charmingly atmospheric and the dramatic temperature fluctuations make grabbing your coat in the morning as simple as remembering to brush your teeth. This week, for example, has seen alterations in weather from 80 degrees and sunshine to 25 degrees and snow (27° to -3° for our Celsius-loving readers). Anyway, as I was thinking this over, I started wondering what Blake thought about the weather.